Ticket prices for international fans attending the football World Cup in Brazil will start at $90 (£59, 69 euros) for initial group matches. Football's governing body Fifa announced that the cheapest ticket for overseas fans for the final on 13 July was $440 (£288) and the most expensive $990 (£650). The tournament starts on 12 June next year, with the first game being played in Sao Paulo. Tickets will go on sale from 20 August. Fans have until 10 October to apply and a ballot will be held to decide which of these applications are successful. Only later will tickets be sold on a first come, first served basis. In total about three million tickets will be available for fans. For Brazilian nationals the cheapest tickets start at $15. These are only available for students, those aged over 60 and people on social welfare programmes. For other Brazilians tickets start at $30. The lowest price paid for a ticket in the 2010 World Cup in South Africa was $20, also for group stage matches in the special category set aside exclusively for residents. 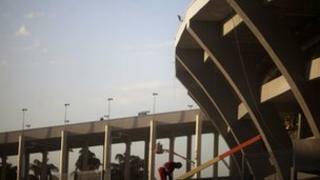 The governing body had previously said that tickets in Brazil would be the "cheapest ever". The Fifa ticket website will include a map of the ground that shows the location of different categories of tickets. This meant there would be "no surprises" over where fans would end up sitting, said Fifa marketing director Thierry Weil, who is in charge of ticketing strategy. Supporters can request a maximum of four seats per match, and for a maximum of seven matches. He said there would be a reselling system run by Fifa, if people were unable to attend games for which they had bought tickets. At least 400,000 tickets will be reserved exclusively for residents of Brazil, with about 50,000 for construction workers who were involved in building and upgrading the grounds for the tournament.